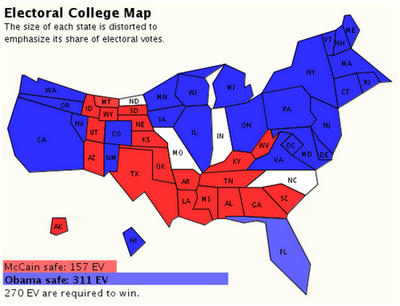 I notice that they have predicted an Obama win in Florida, whereas other projections are still treating that state as too close to call. But otherwise the overall picture accords pretty closely with others I've been seeing. There will be endless bloviating over the significance of today’s results; I plan to do some bloviating myself. But we shouldn’t ignore the importance of chance events, or at least the chance timing of events. Without 9/11, what would have become of George W. Bush? My guess is that he would have lost Congress in 2002 and the White House in 2004. And what would have happened if Lehman had waited until November to blow up? Would smear-and-fear have worked? I think Krugman is obviously right that the onset of the economic crisis(quite appropriately) dealt a major blow to the McCain campaign--and, we might add, to the Republicans in general. McCain's response to the crisis, which helped convince a lot of voters that he was clueless, erratic, and gimmick-prone when it came to critical economic issues, only made matters worse for him. And the timing made a big difference, too. If the crisis had waited until November to blow up, which was no doubt a matter of luck more than anything else, then its political impact would have been quite different. On the other hand, as long as we're speculating, I'm not sure that this one factor was necessarily decisive. My own (non-expert) impression is that McCain's campaign began to go off the rails by mid-September, beginning with the selection of Sarah Palin as his running-mate (a transparently cynical gambit that seems to have backfired in a big way); the more general strategic decision to focus on mobilizing the troglodyte wing of the Republican Party (the so-called "base"), which wound up alienating many moderate and independent voters and even some long-time McCain admirers; the McCain campaign's gratuitous and self-defeating post-convention offensive aimed at demonizing and intimidating the news media, who had previously been fairly well-disposed to McCain and inclined to give him the benefit of the doubt; and the decision to gamble everything on what what Krugman correctly calls a "fear-and-smear" campaign against Obama, in the process sacrificing the considerable asset of McCain's reputation for honesty and integrity, which also seems to have backfired. Even if the economic crisis hadn't broken before the election, McCain could still have lost--after all, his campaign decided they needed some bold gambles because he was trailing Obama all through the summer, even though both campaigns were mostly treading water--though perhaps more narrowly than he seems likely to lose today. On the third hand (if there is such a thing), all these factors interact, and the onset of the economic crisis may well have increased the negative impact of some of the elements I've just mentioned--in the face of potential economic cataclysm, a lot of the other stuff probably sounded like irrelevant background noise to many voters, and the increasingly desperate tone of the McCain campaign probably reduced its credibility even on non-economic issues. Without that context, maybe "fear-and-smear" would have worked more effectively? So maybe Krugman is right after all to say that "It was Lehman wot did it." At all events, there's no question that luck and timing play a big role in these matters--and that timing was especially critical in this case. Napoleon used to say that the most important quality needed by a general was that he should be lucky. 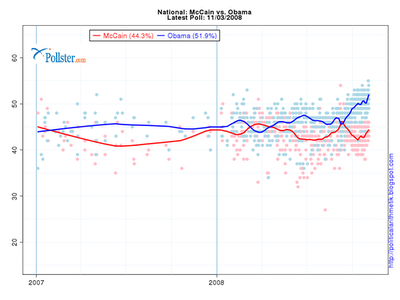 By that standard, Obama's political record suggests that he qualifies very strongly, whereas McCain has crapped out. => If the McCain/Palin ticket should somehow win today, then all this speculation will look pretty silly ... but that will be the least of our problems.